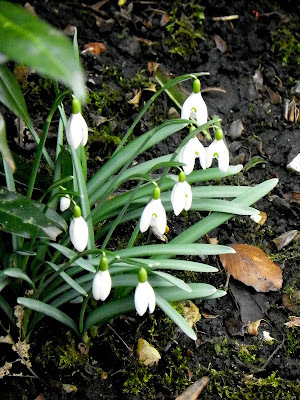 Last week, I told you about our visit to Rufford Old Hall this past March. I also mentioned that our route was circular and that we'd stopped someplace else before we returned to our snug farm cottage on the Lancashire-Yorkshire border. 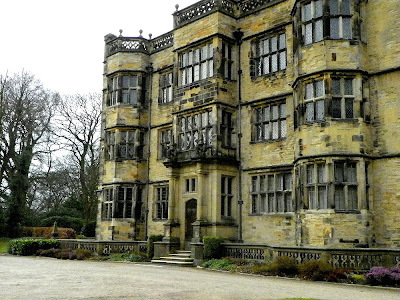 That "someplace else" was another National Trust property, Gawthorpe Hall. When I saw it in the Trust handbook, I couldn't resist wanting to see it because it reminds me of one of my all-time favorites, Hardwick Hall. When I read further to see that Gawthorpe also houses an international collection of needlework, lace and costume, I knew I had to go. 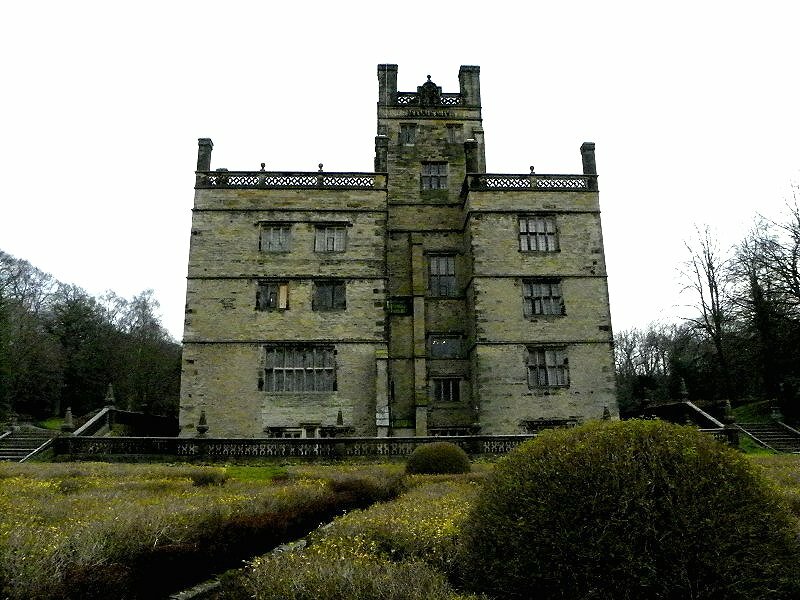 Unfortunately our timing wasn't the best because on the day that we could visit Gawthorpe Hall, it wasn't open. Instead of being able to see that collection of needlework, Denis and I would be resigned to wandering the grounds. 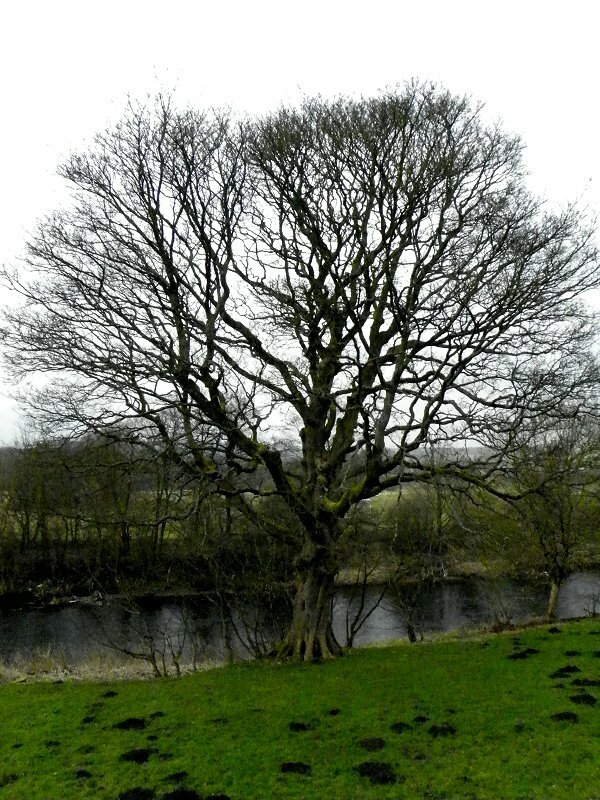 The Hall was originally a pele tower-- a fortified keep or tower house-- built by the Shuttleworth family on the banks of the River Calder in the fourteenth century as a defense against those invading Scots to the North. The Elizabethan part of the house was dovetailed around the tower some 300 years later. By the time we'd finished touring Rufford Old Hall and driven to Gawthorpe Hall, the "sunny intervals" so beloved of UK television weatherfolk had disappeared, and the day had turned grey, damp and windy. We parked our rental car and began the trek to the house through trees, found our way up and down through series of stone steps, and finally approached the house from the left side. 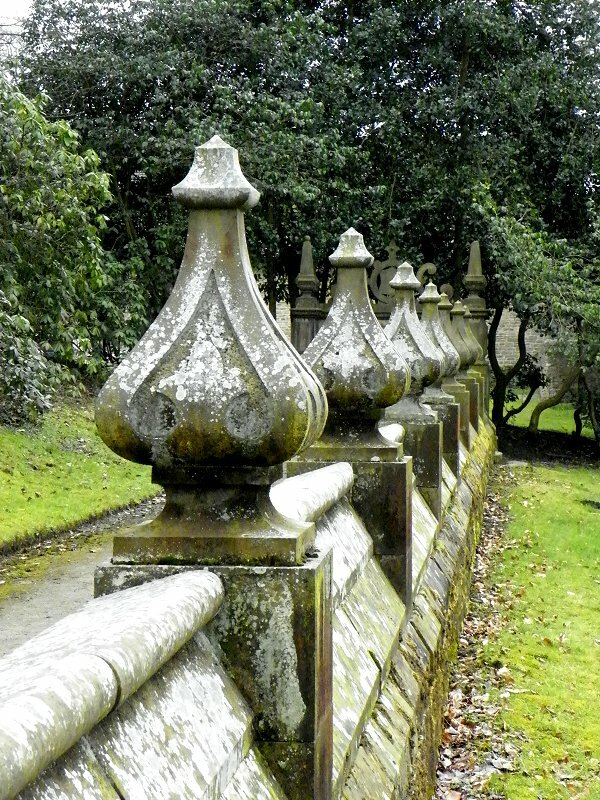 I've placed the following photos in the order in which we explored the exterior of the house. If you'd like to see any of them in a larger size, just click on the photo and it will open in a new window. Old houses often speak to me, but Gawthorpe Hall ignored me. Perhaps it would have been more friendly if we'd come on a day when we could see its interior. Who knows? 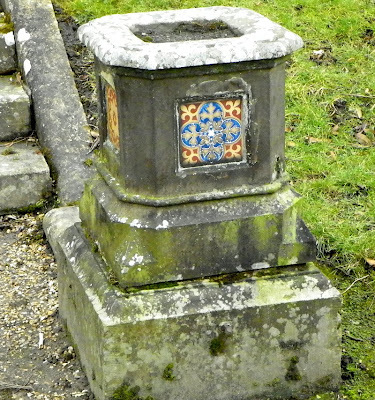 But in looking at it as I walked the grounds, it looked sad to me. When the weather decided to warm, the sun remembered to shine, and the trees, shrubs and flowers came to life, I hope it shed its gloomy appearance and cheered up a bit. 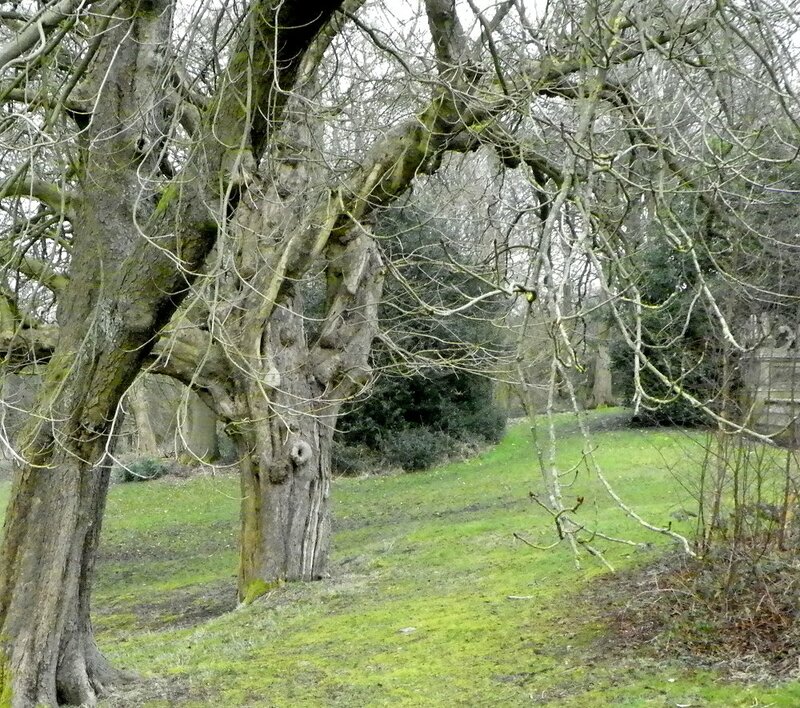 When walking around the grounds of these stately homes, you're often looking at trees that have been around almost as long as the house... sometimes longer. I've gotten used to seeing some interesting pruning methods, but as I came around the side of Gawthorpe Hall and saw a large old tree that looked as though one of its limbs was braided, I had to blink and rub my eyes. How did they do that? As I stood in the gardens of Gawthorpe Hall, I made a mental note to see some of these places in spring or summer. 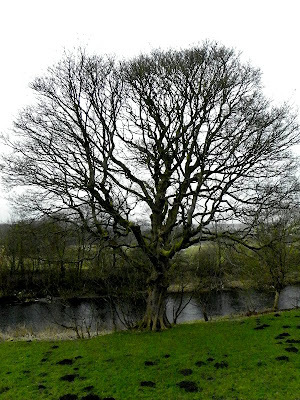 I watched the River Calder flow silently along and tried to picture leaves on the trees and the flowers in bloom. The motto of the Shuttleworth family is "Prudentia et Justitia" or "Prudence and Justice." You can see it at the top of the pele tower. I took a fancy to the decorative stone planters with tile insets that are in the garden. It was easy for me to see how lovely the grounds would be to walk in when spring arrived. Even on a dark, damp, cold and windy day, I could hear birds all around us in the trees. Little did these brave snowdrops know, but they would be buried in the white stuff in two or three days! When we decided we'd had enough of the wind, we walked slowly back to the car park. We sat for awhile, running the car engine so the heater could warm us up, drinking bottled water and talking about what we'd seen. There was one more surprise in store before we left. As we talked, I happened to see something moving on a tree trunk right in front of our car. I hurriedly took a couple of photos through the windshield before it could scuttle around to the other side out of sight. When we got back to the cottage, I looked it up in my UK bird book. (Of course I've got one!) 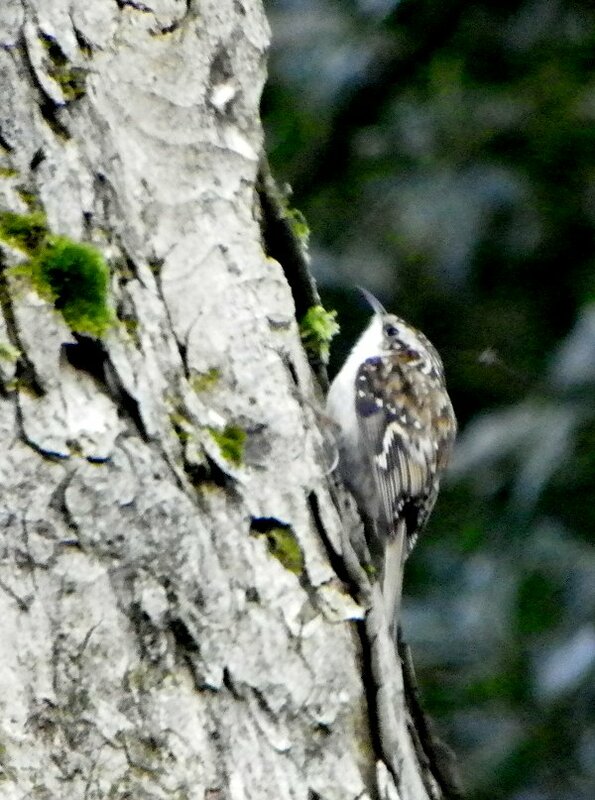 After seeing two beautiful old homes, we'd gotten to watch a tree creeper looking for a meal. Denis and I decided to order from a local Indian takeaway while we warmed ourselves up with big mugs of tea. I hope you enjoyed this chapter of our UK trip. Hopefully next week I'll be able to show you some of Cambridge! Beautiful photos, but the do show what a gray day it was. Thanks for the tour. That was pretty much the skies Denis and I dealt with throughout the English part of our trip. Those "sunny intervals" were few and far between-- and the only time we had brilliant sunshine was in the far NW of Scotland! Goodness, this place looks like a prison - or maybe it's just the gray weather. Fascinating though and I do love the setting by the river. I think England should have a day to honor all those ferocious Scots who inspired them to build so many lovely castles to protect themselves. :) So glad you spotted the lovely little bird.